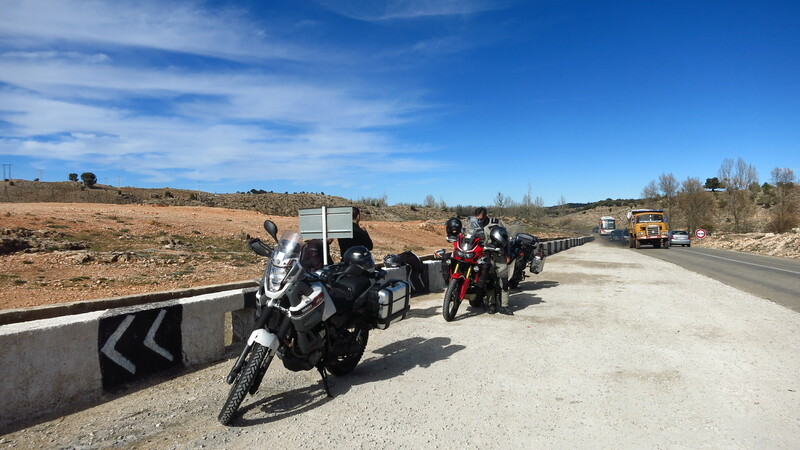 Most people think that the main drawback of travelling by motorbike in winter is the cold, and they are right, but there is another major factor at play that many forget – the hours of sunlight. 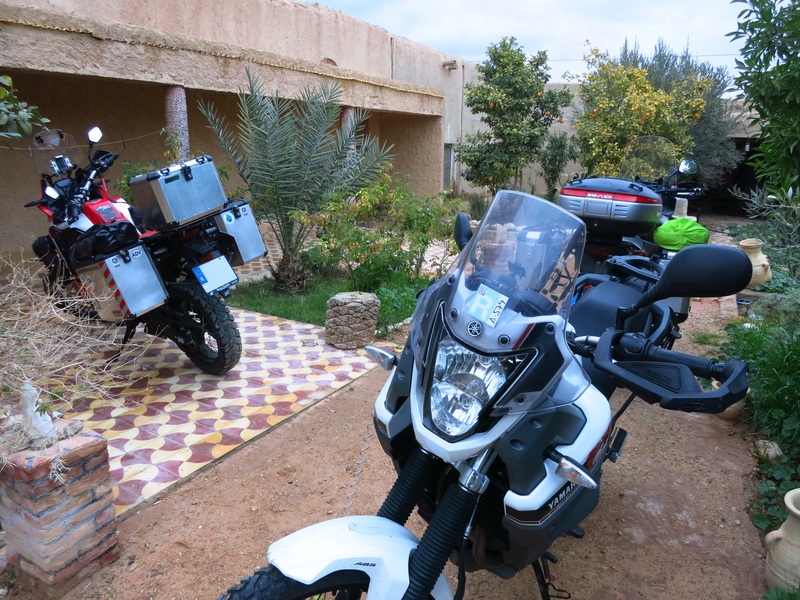 While it would have been possible to make the most of the day and go directly from Fez to Merzouga in spring or summer, now we had to stop no later than 5pm because it got dark and temperatures drop very low, so we had to do the journey in two days. 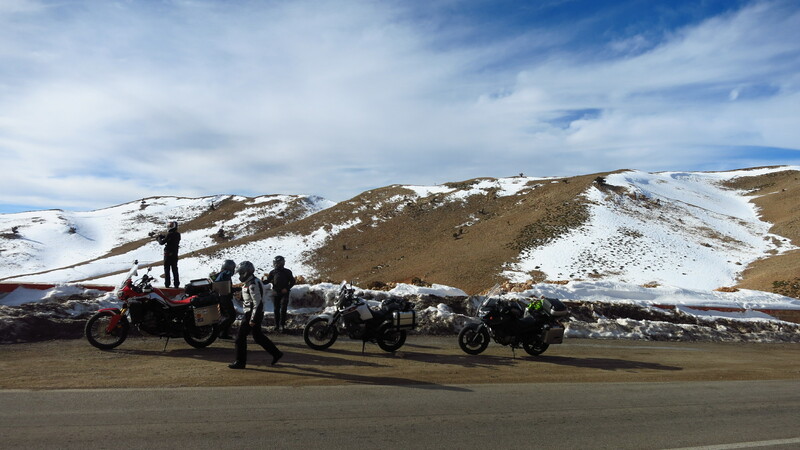 Because we wanted to spend most of the following day riding in the desert in Merzouga, we decided to go as far as possible today and then ride for only a couple of hours the following day. So, another early start. Traffic had been the usual chaos in Fez when we arrived the night before, but today it was rather quiet, even though it was the morning rush hour. We left our palace and headed south through the new part of the city, and after leaving it behind, the road started climbing into the Middle Atlas mountains. We would spend most of the day well above 1,000 metres and, worried about the cold, we had put on several extra layers of warm clothes. The next big town was Ifrane, also known as the Moroccan Swirzerland, and it was easy to see why. If you think ‘desert’ when thinking about Morocco, think twice. At over 1,600m above sea level, we found a quaint town with snow and luxurious houses that would not look out of place in the Alps, with a skiing resort past the town. 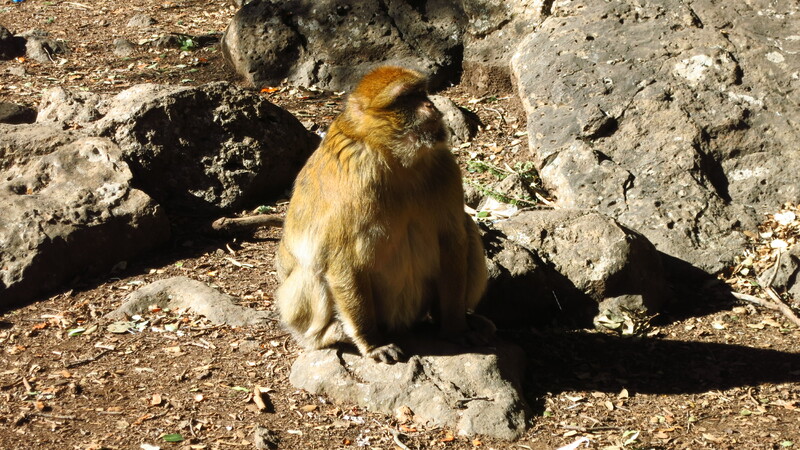 Past Ifrane, the road took us close to Azrou and then into the foret des Cèdres, a thick forest with a great mountain road where I had a great time and where this amazing country brought us yet another surprise – monkeys! The forest is full of them, and they are a big tourist attraction, together with a tree called Cèdre Gouraud, a cedar over 800 years old. As we kept gaining altitude the forest cleared until there were no more trees and a vast expanse of snow opened in front of us. The temperature dropped gradually and reached a minimum 6 degrees Celsius as we rode over the highest point of the day, the Col du Zad, almost 2200 metres above sea level. 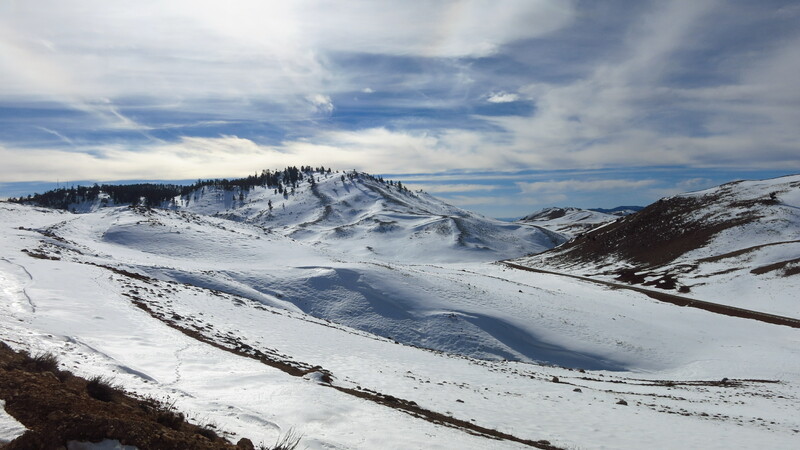 The snow remained part of the landscape until we started losing altitude again and the landscape turned into rocky desert plains on the way to Midelt, where we stopped to have some much needed hot tea before the last leg of the day. With the sun already low, we descended to the river Ziz, which we followed past the tunnel du Légionnaire and into the Gorges du Ziz, an amazing canyon that opened into a big reservoir built in 1976 to prevent the flooding of the palm tree plains down along the river. 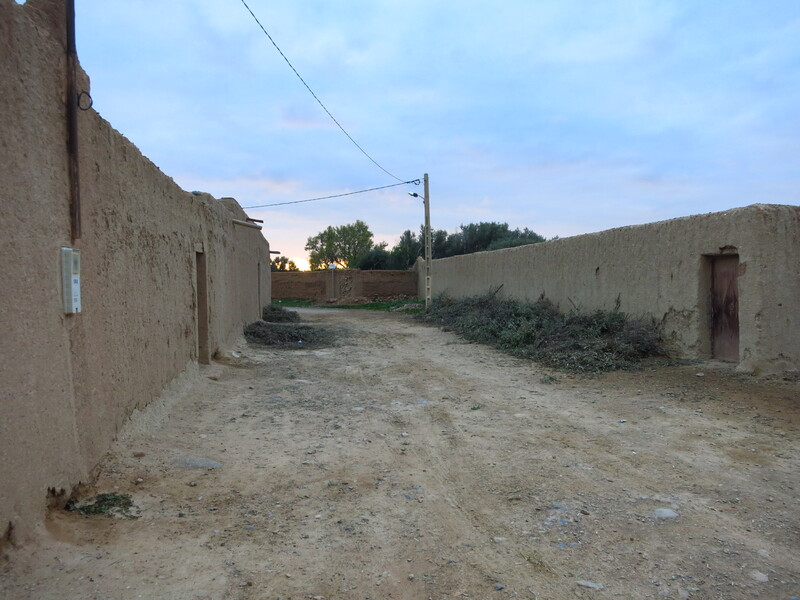 Just after sunset we reached the outskirts of Errachidia, where we turned off the main road and rode a dirt track to a small group of houses made of mud and straw – we were going to spend the night in one of them, Gite d’Étape Khettara Oasis. A group of children, fascinated by the bikes as all children are, pointed us in the way of the house, and a small wooden door opened and man welcomed us into a beautiful inner courtyard. We were allowed to park the bikes inside for the night, and after squeezing the heavy beasts through the door, we unloaded them and were shown our room. 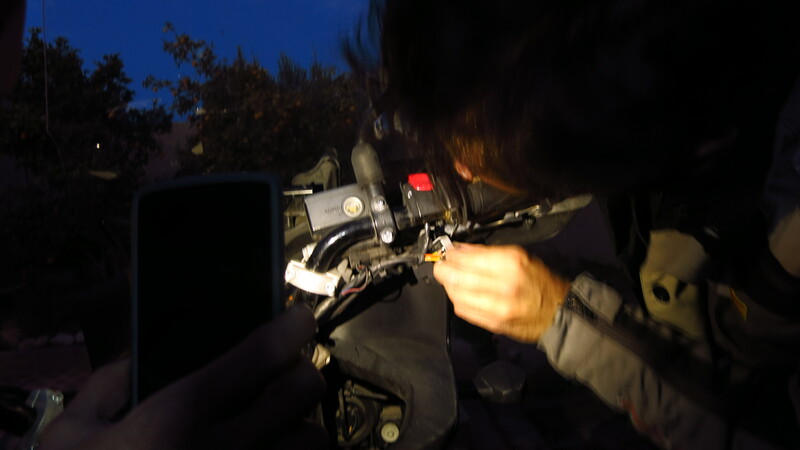 Before settling down we set about fixing the headlamp in Gerard’s bike, which had stopped working in the morning. Fortunately, I had had the same problem with my V-Strom a few months later and knew how to fix it – it was a faulty ignition switch contact, which needed cleaning and adjusting. The owner of the house came shortly after and told us about the region and its history. He had been born in that same house, but after several consecutive years of unforgiving draught, his family had been forced to move to the city and try to make a living there. Fortunately for him, his father insisted that he kept going to school, and he had gone on to obtain a degree in physics. Feeling that he owed something back to his hometown, he had returned and turned his family house into a traditional guesthouse that was part of a network of sustainable tourism establishments in the Ziz river region. They employed local people and used local produce, and reinvested the money in improving water and irrigation facilities to support the local farmers. 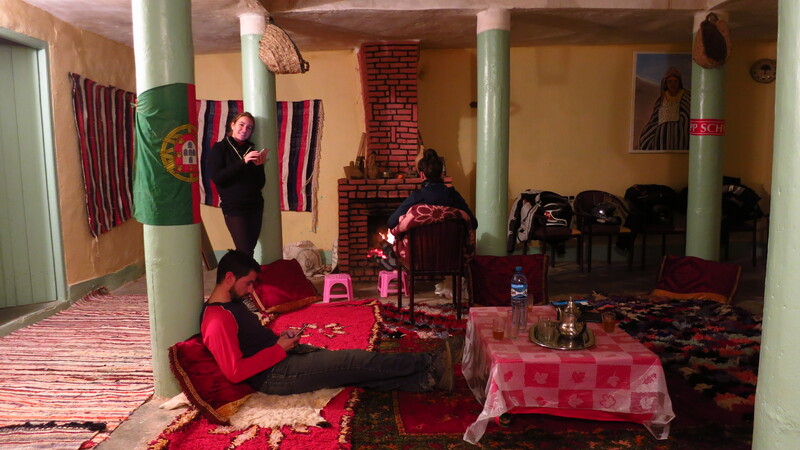 We enjoyed an excellent dinner in front of a fire in the central room of the house and went to bed early, ready for our first desert experience the following morning. This entry was posted in Moroccan Christmas 2016, Travel and tagged Atlas, Azrou, Cédre Gouraud, Col du Zad, Errachidia, Fez, Foret des Cédres, Gorges du Ziz, Honda CRF 1000L, Ifrane, Midelt, monkeys, Morocco by Kilian. Bookmark the permalink.